The world reacted with shock and grief on Friday morning when CNN reported that celebrity chef and author Anthony Bourdain had died at 61 years old. Considered perhaps the most influential force in culinary entertainment, Bourdain died by suicide while filming an episode of "Parts Unknown" in the Alsace region of eastern France. He was discovered in his hotel room Friday morning by fellow chef and onetime Philly restaurant owner Eric Ripert. Tributes to Bourdain's life and achievements poured in on social media as many remembered the larger-than-life personality, worldliness and charisma that came to define his place in the culinary world. 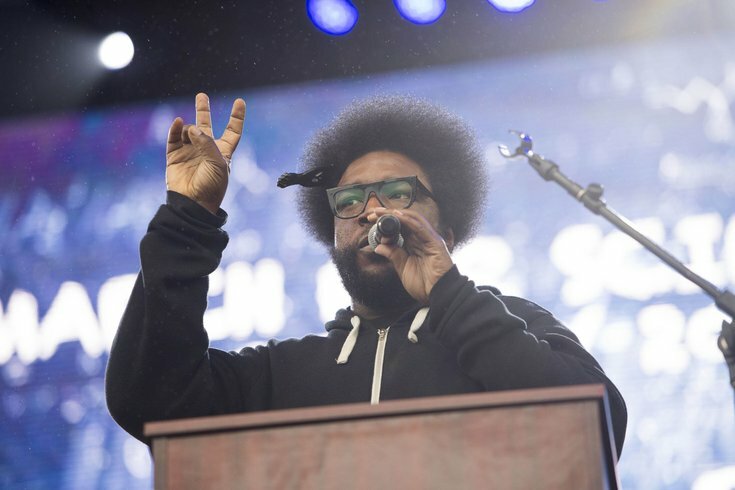 Among those who honored Bourdain on Friday was Ahmir "Questlove" Thompson, The Roots drummer who got to know Bourdain through his appearances on "The Tonight Show Starring Jimmy Fallon." A foodie himself, Questlove credited Bourdain with shaping his personal and professional life. Just saw the news this morning about Anthony Bourdain’s passing. I have so many thoughts about him—memories, emotions, and unanswered questions—that right now it’s sort of a jumble. I feel so thankful for him to introducing me to a world I never knew, the world of food and especially food around the world. It was through Anthony that I learned about the sushi master Jiro Ono was and that recommendation (seeing the Jiro doc & making a pilgrimage to Tokyo by any means necessary) singlehandedly changed the course of my professional and creative life. Anthony also believed, and talked often, about how all forms of creativity were connected: how chefs and drummers and comedians and actors and directors and painters all drew on the same well of thoughts and emotions. That feeling stuck with me. Watching him take trips to faraway lands to get a taste of heaven (and, just as often, to show how life on earth can be hell for people under the thumb of cruel governments or oppressive poverty) was the equivalent of my many trips to obscure record shops continents away. Lastly I’ll miss our endless banter about the merits (or lack therof) of Yacht Rock. Anthony came on Fallon often, and every time he liked to warn me that his walk-on music better have “some umph to it.” He wanted power and attitude. I’d agree with him, and then I’d play another Billy Joel song, which infuriated him. A few years back, to thank him for writing the foreword to my book, I started the ultimate troll project, though I never got to give it to him. We had an “argument” over Herb Alpert’s “Route 101”: I made the case that the song’s good-feeling/good-time vibe couldn’t be denied, and he made the case that he denied it, and the more heated the argument got the more we laughed. I told him imma make him the mother of smooth-pop playlists and then he would see the light. I’m finishing that playlist, and when I do, I’ll name it after him, just so I can imagine that laugh of his. Bourdain's death came days after fashion icon Kate Spade took her life at 55 years old. Both losses have raised concern about a worrisome rise in suicides and the need to commit more resources to prevention and mental health awareness. Health experts have warned that suicide is an increasing issue in the United States. A recent survey from the CDC found that suicide rates have gone up 30 percent in half of the states since 1999. A message from the National Suicide Prevention Hotline: We can all help prevent suicide. The Lifeline provides 24/7, free and confidential support for people in distress, prevention and crisis resources for you or your loved ones, and best practices for professionals. Call at 1-800-273-8255.